When editing a contact, you can add multiple phone numbers and email addresses of different types (home, work, etc. ), a custom ringtone, a note or a variety of different fields (like birthday, website, office location and so on). 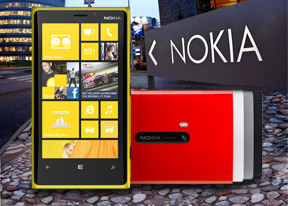 The Nokia Lumia 920 offered loud and clear in-call sound and we had no issues with signal reception. We ran our traditional loudspeaker test and the Lumia 920 scored an average. The loudspeaker isn't the loudest around but missed calls shouldn't be a problem. You can read more about how we do tests here. Messaging is separated into two tabs - threads and online. Online shows you who's online with the people you've talked to most recently on top. This makes finding someone to talk to very easy. You can choose which service to use to send a reply and the text box will remind you of what you're currently using with a message like "chat on Facebook". Individual messages can be copied (only the whole message), they can be deleted or forwarded. Whole threads can be deleted too. You can mark individual emails, mark them as read/unread, set flag, clear flag and more. Finally, you can search your entire mail for individual emails - it's a very useful feature, especially for those with large inboxes. Selecting text is very simple, but does require some getting used to. You hold your finger over some text for a second or two and then release. The text area gets highlighted and then you can move the beginning and end cursors to adjust how much text you want to select. A little icon pops up with the available actions and the selected text is available to paste anywhere in the OS.